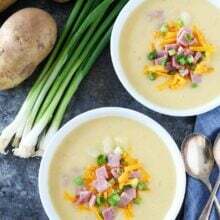 This easy Cheesy Ham and Potato Soup is the perfect recipe to use up your leftover Easter or Christmas ham. The soup is creamy, comforting, and so easy to make! If you are looking for a recipe to use up your leftover holiday ham, make this Cheesy Ham and Potato Soup. 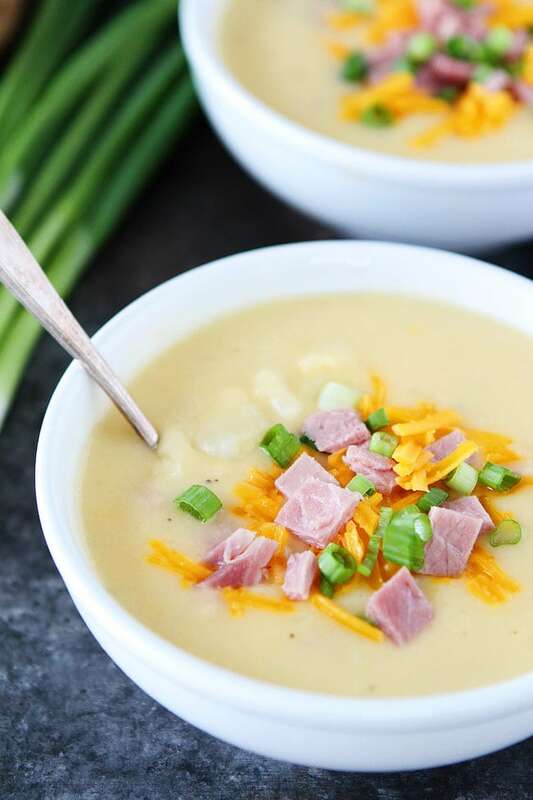 This easy, ham and potato soup is a family favorite and a great way to use up leftover ham. Sometimes we make ham JUST so we can make this soup. It is super comforting and delicious. And if you want to go all out, serve it with biscuits or crusty bread. The ultimate comfort food! Josh makes this soup after every big holiday because we always end up with leftover ham. I think he plans it that way so he can make Cheesy Ham and Potato Soup. It is his favorite. 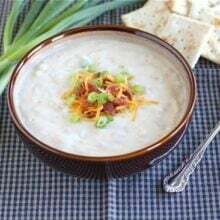 The soup makes a great meal, especially after a big holiday, because it is super easy to make. You deserve a break after cooking a big holiday feast! This soup can be made in about 30 minutes. Yay! We use russet potatoes, but Yukon gold potatoes work well too. You can use chicken broth or vegetable broth for this soup. Use whatever you have in your pantry. We like to use our hand blender to puree the soup in the pot. It makes it super easy. If you don’t have a hand blender, you can transfer the soup to a blender and blend. Just be careful with hot soup! You will want to let it cool down a bit before blending. We have made this soup with skim milk and 2% milk, both work great. We like to use sharp Cheddar cheese for extra flavor. 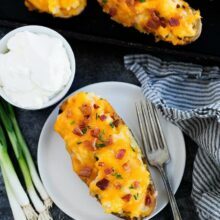 You can use regular Cheddar cheese if you wish. Pro tip-use pre-shredded cheese to make the recipe even easier. If you have leftover ham, you can put it in the freezer and pull it out anytime to make this soup! It is always nice to have in the freezer. Garnish the soup with chopped green onions, if desired. 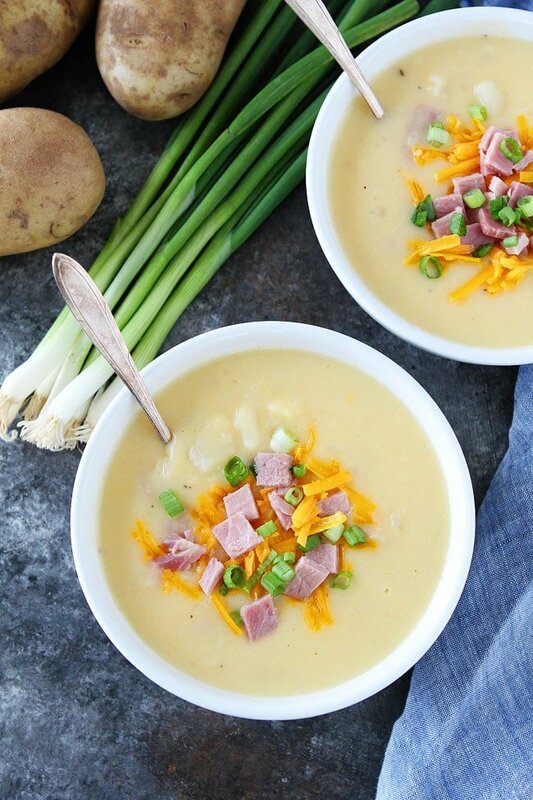 Make sure you have some leftover holiday ham so you can make this Cheesy Ham and Potato Soup. And if you don’t have any leftovers, you can always buy ham to make this soup. It is worth it! This soup is creamy, cheesy, comforting, and SO delicious! 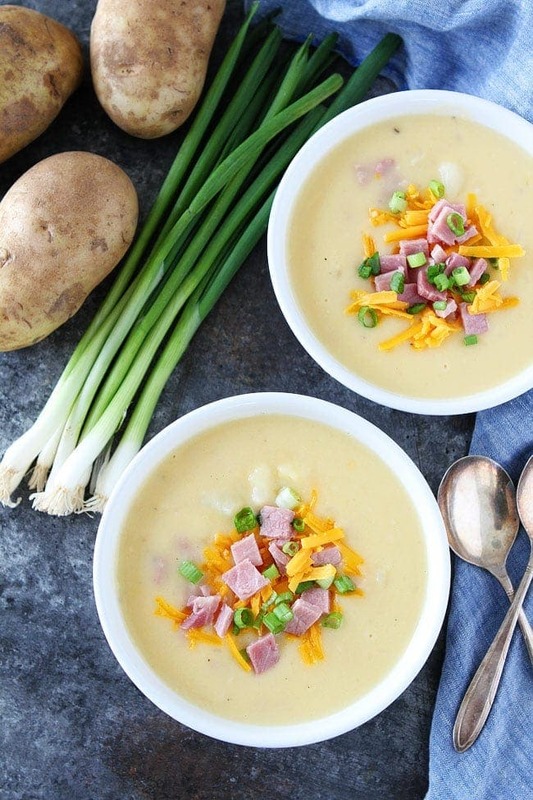 Use your leftover holiday ham to make this easy, cheesy, and comforting ham and potato soup! It is a family favorite! In a large stock pot, heat olive oil and sauté onion until tender, about 5 minutes. Add garlic and cook for 2 minutes. Add diced potatoes and broth to the pot. Bring to boil and reduce to medium heat. Let potatoes cook until tender, about 15 minutes. With a slotted spoon, remove 1 1/2 cups of the potatoes. Set aside. Puree the remaining potatoes with a hand blender until smooth. In a medium saucepan, melt butter. Stir in flour and cook for 2 minutes. Whisk in milk, bring to a boil and simmer until thickened. Slowly stir mixture into large stock pot with the pureed potatoes. Stir the reserved potatoes back into the soup. Stir in the shredded cheese until melted. Add in the diced ham. Season with salt and pepper, to taste. Ladle the soup into bowls and garnish with green onion, if desired. Enjoy! This sounds like the perfect way to use up those Holiday leftovers. I cannot wait to try this! Yum! This is a really nice way to use up the inevitable leftover ham from Easter Sunday! I love it, but we can never finish it all. I bet that this is so good! Looks like major comfort food! I want an extra large bowl of this tasty soup! Nice, good thinking! My hams seem to get pretty dry pretty quickly, so why not use them for a protein boost for this soup, thank you! I am always in the mood for such a comforting soup! Hey there! I just wanted to let you know that I made this soup for my​ family this week and they loved it. Thank you for providing recipe’s that are easy to read and follow, and don’t have too many ingredients or complicated ingredients. I have tried several of your recipe’s now and they are always a hit here, so thank you, thank you!!! I am so happy you are enjoying our recipes. Thanks for letting us know! I love this. Ham is such a great ingredient. 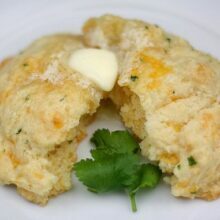 It’s awesome fresh baked (and usually easy to make) and perfect for flavoring dishes like this. And ham and cheese together…YUM. 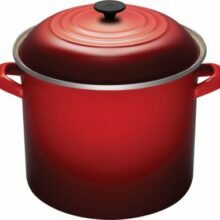 What a delicious comforting soup. I’m so glad we’re in soup season now! This is a really good potato soup. I actually prefer to leave out the ham or serve it on the side. It’s delicious! I sub the ham out for a little bacon. Simply delicious! This was so good!!! Great last meal with leftover Christmas ham. I used gluten free all purpose flour and mix of russet and Yukon gold potatoes since that’s what I had on hand, it turned out great. Kids and husband devoured this soup! Delicious and hearty. Definitely comfort food! I just love how you have pictured the soup, it looks so good. I also like the warning you added about allowing hot soup to cool down before adding to a blender. I remember the frist time I put hot soup into a blender, what a mess, and I was luckly I wasn’t burnt.